Kniffel (Yahtzee) – game rules. Gameplay – see how to play Kniffel (Yahtzee) on GameDesire! You play Yatzy with five dice. The game consists of thirteen turns. Each player rolls the dice up to three times in each turn. Next to the board there is a list of all the required categories. The goal is to score as many points as possible in all the required categories altogether. All categories in the list must be filled. 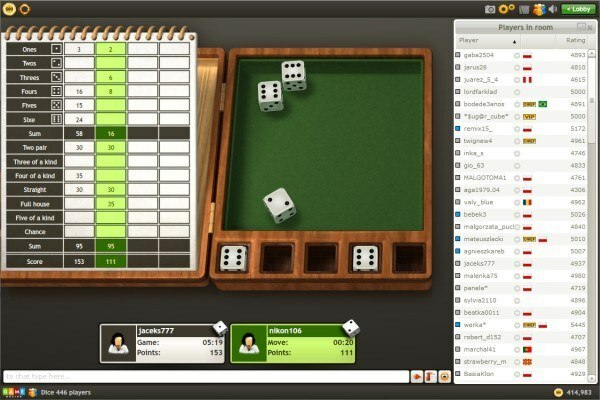 List of categories and the board with chat and player list windows hidden. The dice are rolled by clicking the‘Roll dice’button which appears on the board when it’s your turn. 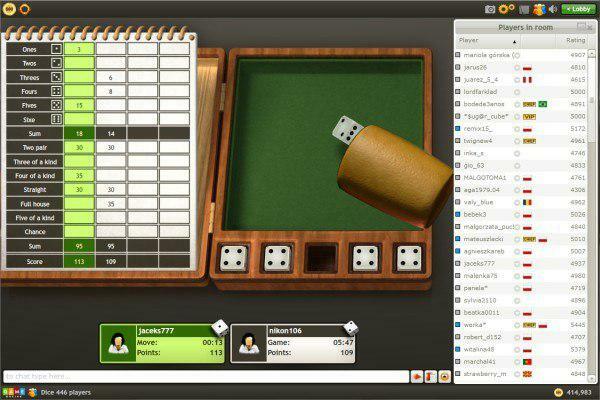 Players are obliged to roll the dice at least once (first roll is automatic), but the two remaining rolls are optional. 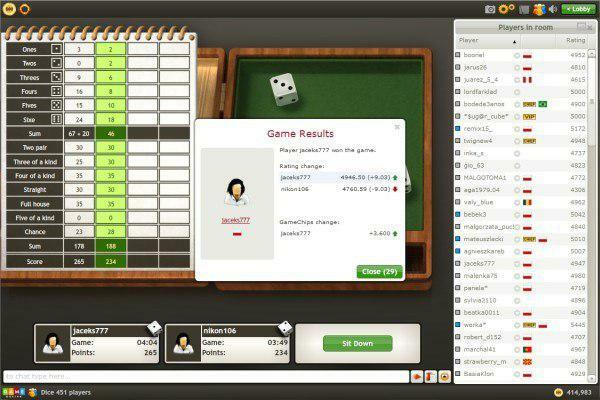 Subsequent rolls are performed with dice you chose not to put aside, which is done by clicking on them. Only dice left on the table can be rolled. An example of scoring for a simple category. If you select the wrong category, your turn will be underscored. For example, if you rolled two two pair, but selected three of a kind, then you are scored 0 points in the three of a kind category. In some instances you have to choose between two categories. For example, if you hit three fours, then it would be better to select the ‘three of a kind’ category, which would give you 35 points. If you select the ‘fours’ category, then you would be scored by simply adding up all the fours you rolled, which would be 12 points. Examples of scoring for figure category. *For each unused roll you receive 5 points bonus, up to 10 points. Chanceis scored by simply adding the value of all the dice, regardless of which numbers they land on. Extra bonus for rolling five of a kind is received only if the five of a kind category is already scored (non-zero). The game is finished after thirteen turns, or when one of the players is out of time. The player with the highest total score wins. © GameDesire Ltd. 2019 Alle Rechte vorbehalten. Millionen von anderen Spielern warten auf dich! Spiel unsere Spiele und erfahre, wie es sich anfühlt, zu gewinnen!